What a shot of colour can do! Oh, oh, oh….I love the woman in the first photo! She looks like a fantastic person! Thank you Angeline, Eleanor is a star! And of course her name is Eleanor . . . she looks like an Eleanor. Oh, my. That’s a striking shade of lipstick in that first photo. Is the second one some kind of psychedelic visor? A striking shade indeed! Not sure about the visor but it does a great turn in the right light! I am sure you are right about the stories Kris! It’s the hand, isn’t it? 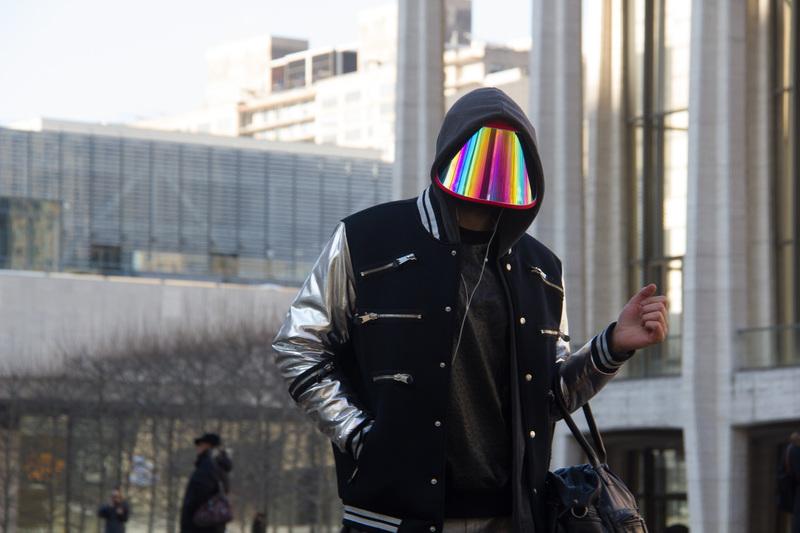 What the best dressed cyborgs are wearing this year! No excuse for winter drearies here, thank you Malin! Exactly :)) and my pleasure, Patti. So much positive feelings in your images! Fabulous photos, love that smile! Thank you Bente, a radiating smile for sure! People are still well wrapped up. I thought it would be warmer by now. 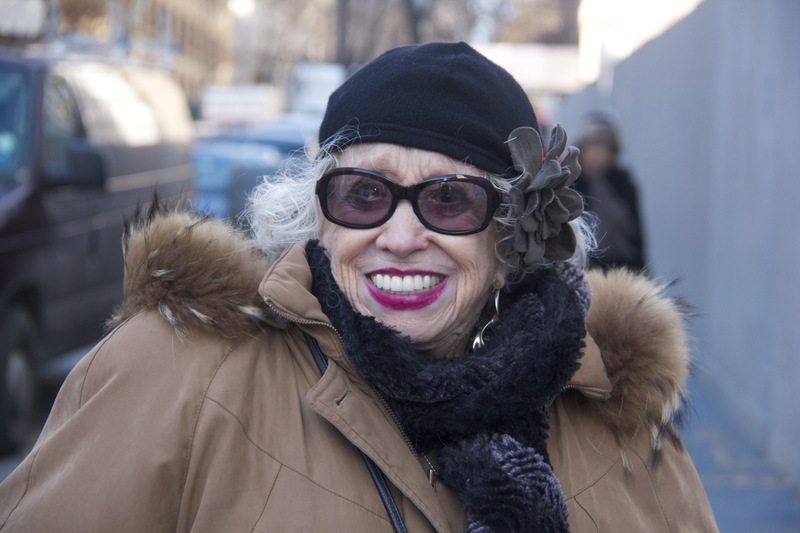 Never mind, the lady looks warm enough, great smile and optimistic to wear sunglasses. The visor person has a thing about zippers. Each to their own. They all tell a story. Thank you. They are not the most recent shots Gerard but yes, it is still cold here, 32.F and bright blue sky overhead. I have to tell you, I’m one of those people who always wears sunglasses, whatever the weather. It’s my optimistic attempt to reduce frown lines and wrinkles after years of squinting in the light of day! Oh, and we’re getting more snow tomorrow apparently! Great shots and splashes of color after a dreary winter Patti 🙂 You get smiles on your street portraits, I get dirty looks, LOL. Really Joe? We need to go walking, I want to see those dirty looks! Especially paired with a 100 watt smile! 🙂 Love them both Patti. And such a great set of teeth! Thank you Madhu! Well Lignum, what to say??? Eleanor’s smile trumps my feeble attempt to radiate love, joy and happiness! I am very grateful to all those who give you a smile to brighten our grey days. Such a pleasure to share with you Marcelo, thank you always! Kolor is Kool sometimes… 😉 That lippy is well bright! Oh, these are both so brilliant (no pun intended)! Your street portraits are so great, Patti. There’s always so much life in them. Streets full of life, thank you so much Richard! I’ve been looking for a chic older woman to be my inspiration (with little success). Thanks for filling the bill to you — and to your model! Happy to inspire you Judith via all the fabulous role models here in NYC where, if I have learned anything from living here, it’s your call, your shot. Be your fabulous self! I want one of those visors! Simply awesome! Eleanor is fabulous- wonderful portrait, Patti. Thank you Jane, Eleanor was a fabulous model! Eleanor certainly made my day, thank you so much Poppy! These are wonderful! I’m still smiling! That’s so good to hear, thank you Elena! Lincoln Centre? Like the vertical rainbow in the second shot. Pow! Such life from Eleanor – beautiful. Two different portraits. The smilling face and the colourful man.